Perhaps the oddest BBQ sauce is the mayonnaise based white BBQ sauce in Alabama. If you taste it straight out of the jar, it has a vinegar twang that will cross your eyes. Glazed onto smoked or grilled chicken it has a flavor that is all kinds of crazy good. Yesterday I was making a smoked chicken to go with beans and mac and cheese when inspiration struck. The mac and cheese is a stove top version by Chef Richard Blais, runner up in Season 4 of Top Chef. 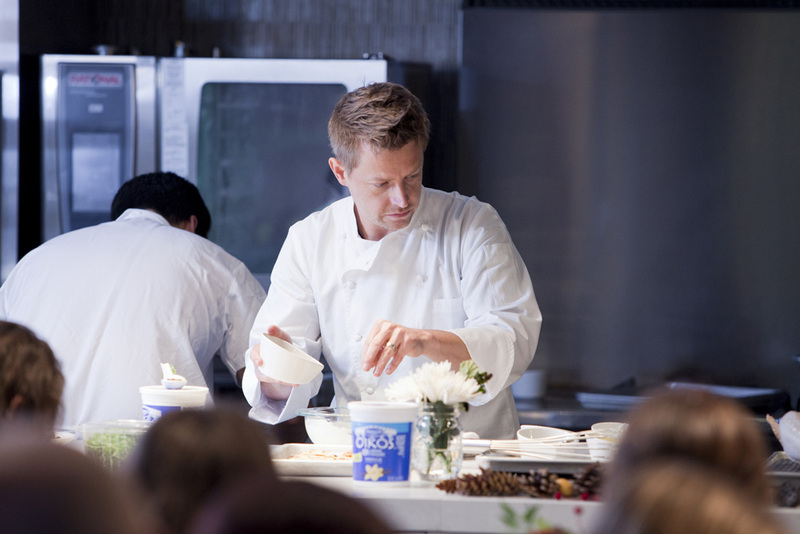 Richard has been working on taking holiday classics and giving them a healthier spin. Speaking of healthier, he has lost 60 pounds in the past few years and is now an avid runner. Look how slim he is now compared to when he was on Top Chef. Okay, back to the mac and cheese and bbq sauce. Melt the butter and add in the flour while cooking in a pan over low heat. Continue to whisk the mixture until the flour's color is tan and has a sand-like texture. Reserve for step 3. Cook elbow macaroni in boiling salted water per box instructions and then chill under cold water. Set aside. Bring the milk to a boil. Then reduce the heat and whisk the roux into the hot milk. After the roux and the milk are fully combined, mix in the cream cheese and the Dannon Oikos plain Greek nonfat yogurt. Once this mixture starts to thicken, remove it from the heat and whisk in the shredded cheese, garlic salt, white pepper, and nutmeg. Add the chilled macaroni to the sauce. I cooked the roux in the pot and then added the milk instead of messing up two pots. As I hauled out the mayo jar to make the white BBQ sauce, I saw the yogurt next to it and that is when inspiration gave me a good whack. 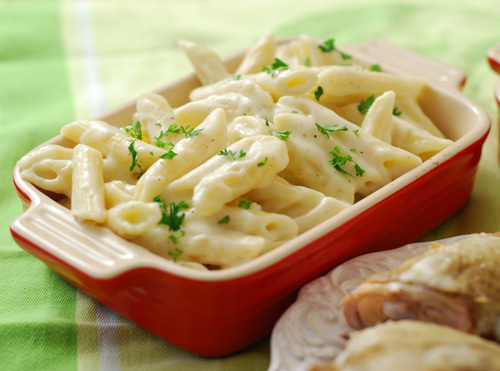 Why not try making the white sauce with Greek yogurt? Then I compared nutritional values and found that just by substituting one cup Oikos non-fat Greek yogurt for mayo, I was cutting 630 calories and 77 grams of fat from the recipe and adding 21 grams of protein. Holy schnikes! It was worth trying on that alone. But the real test is the taste. So I made up a batch of the white bbq sauce using it and found not only was it "as good" as the regular recipe, I actually liked it better! Thoroughly whisk ingredients together and store refrigerated. 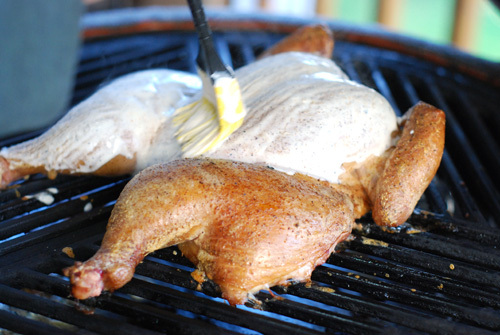 Brush on to smoked or grilled chicken in the last few minutes of cooking. Big Bob Gibson's actually dunks their whole birds in a big pot of the sauce but I just glaze it on. 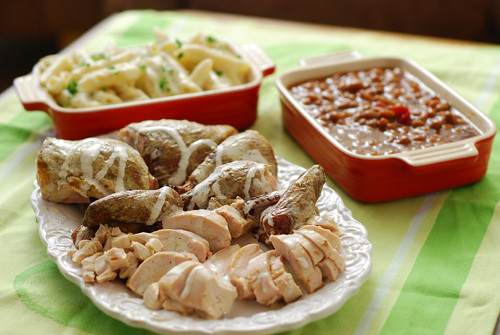 Smoked chicken, mac and cheese, and pit beans. The family loved it all, going back for seconds. We always do baked mac and cheese so I was wondering how they would like this easier stove top version. Trevor specifically mentioned how good it was. This will be my "go to" version of Alabama style BBQ sauce from now on. As I write this, I find that I am craving that bbq sauce again already. I might go grill some wings for the game and toss them in it.